THE contrast could not be greater. 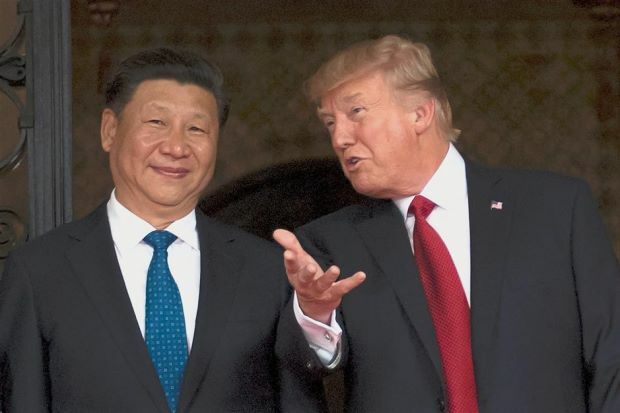 While United States president Donald Trump raves and rants – and belts this or that person – China’s president Xi Jinping looks measured and assured as he offers a global future to the world. Xi is no angel of course, as his political opponents would know, but his system conserves and protects him, as Trump’s would not. If only Trump were the leader in a centrally controlled political order – but even then his temperament would blow it apart. Leadership, like politics, is the art of managing the possible. Trump does not understand this, and does not know how. Xi does, knows why, and knows how. He has a growing economy too behind him, whatever the hiccups. Trump only promises one, without any clarity or logic. His plan to boost the American economy, based primarily on slashing corporate tax from 35 to 15%, is likely to flounder in an American Congress seriously concerned about its causing the fiscal deficit to balloon. Already Trump has had to climb down from trying to secure funds from Congress for his dreaded border wall with Mexico in order to avoid budgetary shutdown in September. The stock market has fallen back from the boost to the price of banks and industrial products following his election. Interest now has returned to what might be termed “American ingenuity stocks” such as Google, Apple and Microsoft on Nasdaq – a proxy for much that is great about America, which Trump’s immigration and closed-door policies threaten to destroy. Meanwhile Xi has been rolling out his “Belt and Road” plans – something he first envisaged at the end of 2013 – for greater world connectivity and development, committing funds from China and the Asian Infrastructure Investment Bank, and engaging global financial institutions such as the World Bank. Malaysia, for instance, will be an actual beneficiary with additional projects thrown in. China is Malaysia’s largest trading partner. But the US has not been a laggard, being Malaysia’s fourth largest trading partner. And indeed the US remains the largest foreign investor in Malaysia, both new investments and total stock. A staggering statistic not often recognised is that total American investment in Asean is more than its investment in China, Japan and India COMBINED! The point, however, is that this position is being eroded. Trump’s policies are hastening this process. Abandonment of the Trans-Pacific Partnership (TPP) means there is no American strategic peaceful challenge to the Chinese economic juggernaut in Asia-Pacific. Balance is important to afford choice. Absence of choice means serious exposure to risk. Price, quality and after-service standards are affected, not to mention a new geostrategic economic underlining. Over-dominance by China in the region is a price not only countries in the region will pay, something that most probably is on Trump’s mind. It is a price that America too will sooner or later have to pay. China’s Belt and Road proposition is not without its challenges, of course. India is deeply suspicious of the connectivity with Pakistan which cuts across India-claimed Azad Kashmir, about 3000km of it. The link to the Pakistani port of Gwadar, in southwest Baluchistan on the shores of the Arabian Sea, is seen by India as a Chinese presence at the entrance to the Indian Ocean and a hawk eye on the Indian sub-continent. With the Chinese also in Sri Lanka, India is circumspect on China’s Belt and Road initiative. There have also been commentaries on some uneconomic linkages which extend right across the English Channel. All these reservations, however, do not take into account the benefit of connectivity to economies, the time it often takes to get those economic benefits and, most of all, the patience, persistence and long view of history of China and its leaders. One of the most striking things about the Belt and Road map is that America is not there. Of course, Xi Jinping does not preclude America just as much as the US did not say that China was not permanently excluded from the TPP. And of course, in the Old Silk Routes and shipping lanes, the New World – America – had not been discovered. But in their revival, led by now rising and then ancient China after 150 years of national humiliation to the present time, there is the irony that the last three quarters of a century of America world dominance is on course to be marginalised, if not supplanted, by the old Eurasian world centred in an ancient civilisation. Trump does not seem to understand history. The art of the deal is purely transactional. Short-tempered and short-term gratification does not a strategy constitute. So we have leader, system and economic promise distinguishing the two leaders – and the two countries. Instead of America first, what we are seeing is Trump hurrying America’s decline relative to a rising China. We are not seeing a world changed from people wanting to be like a kind of American to being people wanting to be a kind of Chinese. Actually, the Chinese people themselves want to be like a kind of American, with all that wealth, influence and power. What we are seeing is China – not America – leading the way to that desired, if not always desirable, end. It is China that is driving the next phase in the evolution of world economic development. Under Xi Jinping, China appears to be heroically moving towards an epochal point in its Peaceful Rise. With Donald Trump, America is being led backwards and inwards, with all the problems of its governance now all coming out. It is in grave danger of losing in the peaceful competition. Not knowing how to play that game – certainly under its current President – there remains the danger of the status quo power lashing out against the rising one. A Harvard professor has studied what is now called the Thucydides Trap and found in 12 out of 16 cases in which this occurred in the last 500 years, the outcome was war. There are many potential flash points against the background of China’s rise – the North Korean Peninsula and the placement of THAAD missiles in the south, the South China Sea – where Trump may temperamentally find cause to lash out. This is the trapdoor he might take the world down because of failure to compete peacefully. WannaCry ransomeware attacks, how to prevent it?